Things do not look good. 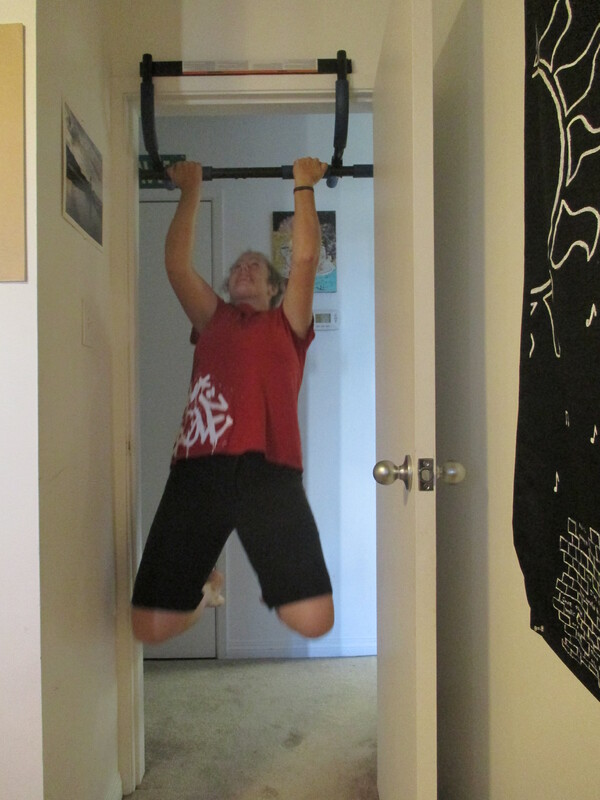 I mean, first of all, the doorway pull up bar does not look like a sure bet. Here’s a quarter-inch of trim we’re going to dangle your pull up bar on (which is twice as thick) and then on top of that, let’s throw on all your poundage and see if that thing doesn’t come crashing down chin up champ wannabe and all. And you can’t just ease yourself into testing those waters. Oh no. As soon as your feet leave the ground 100% of you is basically hanging on that tiny bit of trim that lines your doorways. Talk about not confidence inspiring. But I did it. Not a chin up, mind you – nope, that is a long time coming – but I put my trust in the trim. And, amazingly, I survived. The contraption that I already know is going to be the bane of my existence for the next 3 months stayed perched ever so precariously on the door frame. By the time I got into my workout, my muscles were screaming bloody Mary and not giving two poops about how treacherous my mind thought that dangling device of danger was. I started out with some assisted pull ups with what was supposed to be a controlled descent. I step off a chair and slowly lower myself until I’m fully extended. Wrong. Full of terror, I step of the chair and plummet towards the ground, my muscles straining desperately to do anything, but coming up completely short. I did this 20 times. Next, the hanging leg raise was up. This is where you hang by your arms and lift your legs (not your knees) towards your chest. The only way I could have been more unsuccessful at doing these was if I just stood there instead. I tried. I failed. Immeasurably. My arms are already turning into savage creatures of pain as I hang from the terror bar and kick and swing and grunt trying to make my legs defy gravity and sandwich upwards to my chest. This I also tried 20 times. Later on, I try the stability ball hamstring curls. Also not fun. That damned ball really just wanted to roll around, but not in the direction I wanted it to. So I rolled around with it, legs sliding off every which way until 30 movements that looked like hamstring curls managed to happen. The rest of the things I did were much more successful. But let’s be real, I just compared that success to the aforementioned hanging leg raise. This is going to be my hardest challenge to date. It’s going to be a long hard road.